There’s something to be said about going out with a bang, as we begin our last quick dissent on 2015. From my point of view it's at this time of year we can be both disappointed and rewarded. Brett Booth, Robert Venditti, and Van Jenson didn’t go the easy route though, and gave us underwear or gift cards for the holidays. Oh no! They gave us revelations, drama, and action! It’s December, it’s ALMOST 2016, and it’s DC Comics The Flash! The last time we saw the Scarlet Speedster, AKA The Flash, he wasn’t exactly on good terms with the Central City Police Department. In particular, Captain Darryl Frye, who has forgotten that The Flash is actually a good guy and wants to arrest him. Because that’s what happens when you save people, citing Flash is too powerful and dangerous. This is where things really get heated, as Zoom and his remaining Acolytes make their presence known to the Flash and the police. Zoom also talks more about the monster The Flash will become in the future (Is it me, or does Flash deal a lot more with future and past versions of himself these days? Flash apparently has no luck in / with the future, I guess). Meanwhile, at the hideout of Prof. Zoom, Henry Allen dusts off his doctoral skills to heal the now-depowered and aged Magali. These two are now determined to warn the other Acolytes of Zoom’s plans to steal their powers for himself. Gotta say, I’m enjoying how Jansen and Venditti are employing the Heel-Face turns. Another smallish thing that plays to the books favor is the characterization of Zoom. For all the terrible things he’s done in this book, there’s no doubt that he believes himself to be the hero of this story. Granted, he’s more anti-hero at this point, but still. With the Acolytes on the hunt, you’d think Flash would be less-than eager to take them all on at once. The Fastest Man Alive lives up to his name though, as we’re treated to some impressive action and smart-use of powers by Barry as he ducks and weaves between Folded Man and literally drops Block. But what kind of story would it be if things were that easy for our hero? Not a very fun one, right? Just as The Flash looks to tangle with Top (Roscoe), Zoom steps in to give both Flash and the audience a little lesson about speed and about his influence in Barry’s life. “Speed is a function of Distance and Time”, Zoom said, slapping The Flash silly. “You can cover vast distances -- but Time is my domain.” This was followed by more slaps, of course. Seriously, outside of his super-speed exploits, I feel like Eobard Thawne would be an awesome teacher! 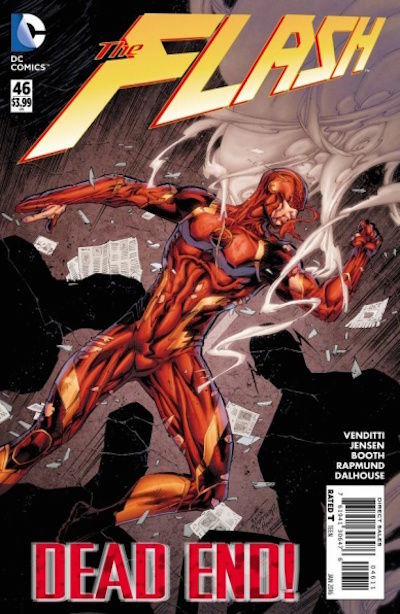 Anyhow, as Zoom wraps up a pretty nice villainous monologue, and attempts to steal the powers of The Flash using the device created by Henry Allen in the last issue, he’s interrupted by Henry and Magali. They reveal his true nature to the other Acolytes, much to his annoyance. At this point there’s a stunning shot of Zoom shadowed that just stands as one of many testaments to the artistic talent of Booth and Rapmund. Zoom looks truly devious with his new design and this shot is proof of that. The Acolytes are not pleased by this, and turn on Zoom in favor of protecting their comrade, using the skills they’ve built as a team against the Professor. Barry then takes this opportunity to add to the party, making use of Block’s super-hard exterior to break Zoom’s weapon and stop him from draining anyone with a pretty cool version of a three-person Fastball Special. The Acolytes manage to make a retreat, promising to see Zoom soon, (fingers crossed), thus leaving only three people behind: Henry Allen, Barry Allen, and Eobard Thawne. 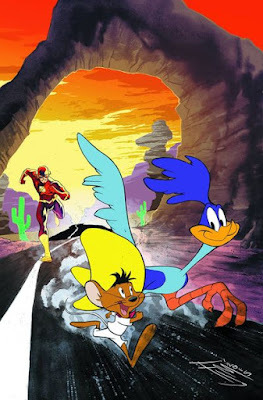 While Zoom was more than happy to do battle with the Flash, he decides that their current venue wouldn’t suit a battle between the two of them. So with Henry in tow, not only does Zoom lead our hero back to his childhood home, but he reveals the secret identity of The Flash to Henry Allen! How will Henry Allen react to the startling truth that he’s been helping Prof. Zoom try and kill his own son? The stage is set for this very personal rivalry to reach its climax in exciting fashion! Be sure to pop in next month for the exciting battle between The Flash and Prof. Zoom! The majority of this comic was filled to the brim with some pretty well-constructed action sequences. As such, it drew to mind a song one would play during a fight. You know, like a fight a gamer such as myself would hear whilst playing a game. Ergo, Crush 40’s Through The Fire! Zoom has led our heroes back to where it all began: The Allen family home... where it all begains… again. Now for those of you who are wrestling fans, I'm sure you will know that phrase well. 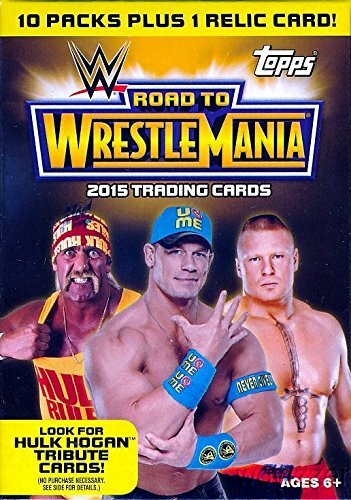 But for those of you who aren't, it’s often used as WWE begins The Road to WrestleMania. We’ve seen The Flash go through a number of challenges to get to this point: Other Speedsters, Gorillas, The Rogues, and the Acolytes. Now it’s just him and Zoom. I’d order the fight between these two on Pay-Per-View or through the WWE Network. I think it costs like $9.99 or something. Hence the comparison to WrestleMania! Many revelations came to light in this latest episode in the Zoom Saga, and a lot is at stake here too. But with the end drawing near, one has to ask the obvious question... What’s next for Barry Allen after facing down Eobard Thawne? The latest solicits have revealed what happens with Flash moving forward, but honestly this doesn’t seem like it will be of the scale this most-recent arc has been. So with that in mind, who would you like to see The Flash face off against next? The Rival (Originally Jay Garrick’s Reverse Flash). Answers on a post-card please. And if not a post-card, the comment system provided.